A Multipurpose Oil Bath and Body massage oil for your little one that is specially hand-blended using Organic Extra Virgin Olive Oil, Pure Sweet Almond oil, Organic Calendula Oil & Lavender Oil. It is absolutely gentle on baby's skin and keeps it soft and supple.The therapeutic Calendula Oil is proven to have skin healing effects, while Olive Oil is the best massage oil for baby's sensitive skin. Vitamin E rich Almond Oil nourishes the skin and helps to strengthen joints, muscles for growth & development. Lavender Oil apart from its antibacterial properties has a special soothing aroma that helps to keep the baby calm & relaxed during and after the bath time. 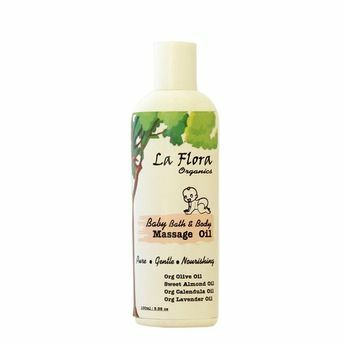 Alternatively, you can also find many more products from the La Flora Organics Baby Bath & Body Massage Oil range.